Even on the days we didn't sled, there was an entire vista of snow fun just outside our front door. 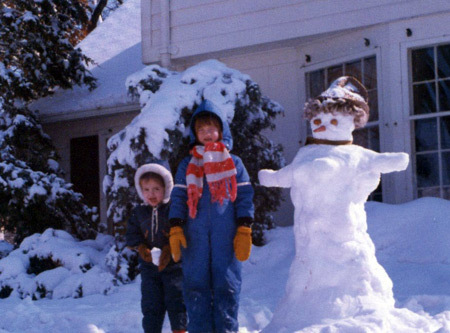 The plows piled up enormous banks of snow on either side of our driveway, and my mother could barely keep us still long enough to get properly snow-suited with scarves tied and bobble-knit hats jammed on our heads before we ran out the door without breakfast. Jennie and I would start by playing King of the Hill. We'd struggle on the slippery snow mounds, try knock each other into the snowy street and sidewalk, and then claim sides where we would build our fortresses complete with parapets, balconies, and turrets. They were magnificent. We'd construct an armory in the back and lay in stores of pre-made snowballs before inviting our friends over for a friendly little snowball fight full of raids, ambushes, and brilliant strategy. From the curb, the snow banks rose close to six feet tall. Some years we dug out the middles and made huts walls and ceilings. They were probably more fun to make then to actually use, since once you were inside, you just sat there, feeling the cold seep through your nine layers. BOR-ING! One weird year we tried to paint the snow. As I recall it, we had seen some Wide World of Disney episode where that giant Disney brush painted shadows and trees and shrubs and woodland animals in a single splashy stroke. We wanted to do just that, so we, quite naturally, brought our watercolors outside and proceeded to freeze up the hairs of several dozen old paintbrushes. We even got into my mother's bottles of food coloring and squirted blue, green, and red dyes into the snow and messed them around. We avoided the yellow because it was a really weak color and on snow, it just would've looked gross. After we had our fill of attempting winter Wyeths, we exasperated my mother by bringing the bottles back stopped up with ice and leaving the snow on the front lawn looking pretty garish. When we could finally be convinced to come inside to warm up for a half an hour, we peeled off our scarves, sloughing slats of snow onto the foyer floor, and yanked off our boots. It was practically impossible not to leave our socks stuck inside the boots, so we were reduced to hopping barefoot across the snow patches into the living room. After dragging our our snoring cats away from the heat registers we'd stick all our snow-crusted things in their place and stump off to the kitchen. Naturally, my mother would have made us hot chocolate to tempt us back inside. Mine was made with hot water because the thought of hot milk used to make me retch. We'd first poke at the Swiss Miss freeze-dried marshmallows with our spoons until they got slippery, then we'd spoon them up and eat while the cocoa was till too hot to drink. Sometimes there would be bubbles floating on the surface that popped and revealed pockets of dry hot chocolate mix inside. We'd spoon those up and eat them as well. Once our fingers were fully thawed we pulled out reserve mittens, scarves, and hats and ran back outside to continue rolling, jumping, and falling in the freshly fallen snow.